Disney CEO Bob Iger just announced that Rogue One: A Star Wars Story star Diego Luna will be reprising his role as Cassian Andor in an upcoming live action series which will debut on Disney + (the upcoming Disney streaming service). The live action series will be a prequel to Rogue One (for obvious reasons) and will follow Cassian on his missions as a spy for the Rebel Alliance. The untitled series will go into production next year. No other casting or production news has been announced. Luna also tweeted the news, adding, "I’m thrilled to share this with you all." The Cassian series is the second live action Star Wars series, and third overall, to be announced for Disney+, with The Mandalorian from writer/executive producer Jon Favreau, and the revival of the beloved animated series Star Wars: The Clone Wars also slated to debut on the streaming service. This is also the second time Diego Luna has reprised his role as Cassian. 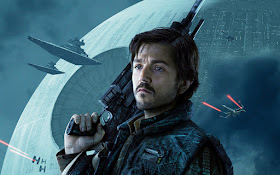 In addition to Rogue One, he also played Cassian in the Virtual Reality experience Star Wars: Secrets of the Empire (which can be experienced at certain The Void locations in Los Angeles, Anaheim, Orlando, Las Vegas, and London). Rogue One was met with near universal-acclaim when it was released almost two-years ago, so it's very exciting to be revisiting such a prominent character from that film. As the above interview demonstrates, Luna was such a cool part of the film and the promotion, so to have him back in such a big way is very exciting.